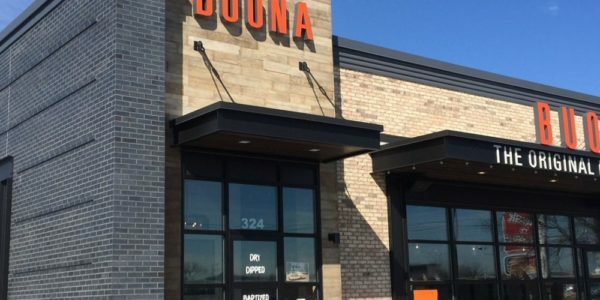 Buona Beef has recently opened a new free-standing restaurant within the development Shoppes on the Boulevard in Schererville, opened last March 2018. This will be Buona Beef’s first location in Northwest, Indiana. Buona is a quick casual dining restaurant, a chain that touts creating the original Italian Beef with other locations in Flossmor, Beverly and Oakland, Illinois. Folks may have seen Buona at the Taste of Chicago, the Italian Beef Fest, and was crowned the Best Regional Eat in America by Goldbely. The Schererville location at 324 US 41 (just south of Woodhollow Drive on 41 near Jak’s Warehouse) will be the restaurant’s 23rd location and the first in Northwest Indiana, according to a news releases. It will seat 130 and offer outdoor seating in the warmer months. In addition to indoor dining, they offer order carryout, order delivery, online ordering, catering and home delivery thru doordash, seamless, and grubhub. Bueno is next to McAlister’s Deli, both helped to kick start this new Shoppes on the Bouleveard development. They can be reached by calling 219-515-6469 or www.buona.com.